MASSILLON Kay’Ron Adams slipped through the line of scrimmage, out into the open and into the end zone for a Warren Harding touchdown. Four plays into Friday night’s game at Paul Brown Tiger Stadium, Massillon was looking at two things it didn’t want to see. Adams getting free and a deficit on the scoreboard. Those two things, however, wouldn’t endure for long. The Tigers would score on seven of their nine possessions, while the Raider running back could never really find the running lanes available he found on his scoring jaunt. All of those added up to a 51-21 win and Massillon’s first 3-0 start since 2014. Adams, the physical and fast Warren senior running back, was the focal point of the Tiger defensive game plan throughout the week. As a junior, he had rushed for 202 yards and three scores in a 31-21 Massillon. Two carries into Friday’s game, Adams looked to be on his way to another such night. He had 66 yards, 55 of those on his touchdown run which gave the Raiders a 7-0 lead 1:13 into the game. Adams would add a 31-yard run on Warren’s second possession, which ended with an incomplete pass on fourth-and-23 from the Tiger 30. However, he wouldn’t have another run from scrimmage for more than 10 yards, as he finished with 123 yards on 20 carries. Adams’ two longest plays in the final three quarters were receptions of 11 and 32 yards. The latter was a screen pass which went for a touchdown in the fourth quarter. While Adams had Massillon’s full attention, the Tigers had their own runner worthy of a defense’s focus. And Jamir Thomas also wasted little time reminding the Raiders of that fact. Thomas ripped off a 53-yard run to the Warren 3 on his first carry of the game, and tied the game with a 1-yard plunge two plays later. 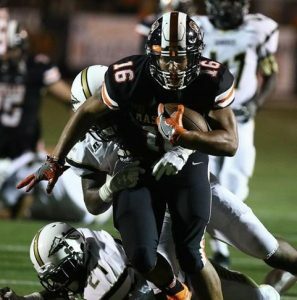 By the time Massillon hit the locked room with a 30-13 halftime lead, the senior running back had already topped the 100-yard plateau for the third time in as many games this season, with 149 yards on 17 first-half carries. Thomas would finish with a career-high 262 yards on 29 carries and two touchdowns. 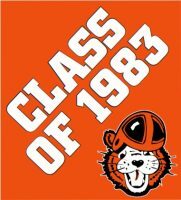 Massillon ran for 380 net yards as a team and finished with 550 total yards. Thomas may have had Warren’s attention, but it found itself distracted by Massillon’s aerial attack as well. Aidan Longwell threw three first-half touchdown – two of which went to Aydrik Ford, plus one to Tre’Von Morgan – as part of a 145-yard first-half effort. Longwell finished 12-of-20 passing for 170 yards. He also ran for a 1-yard touchdown in the fourth quarter. 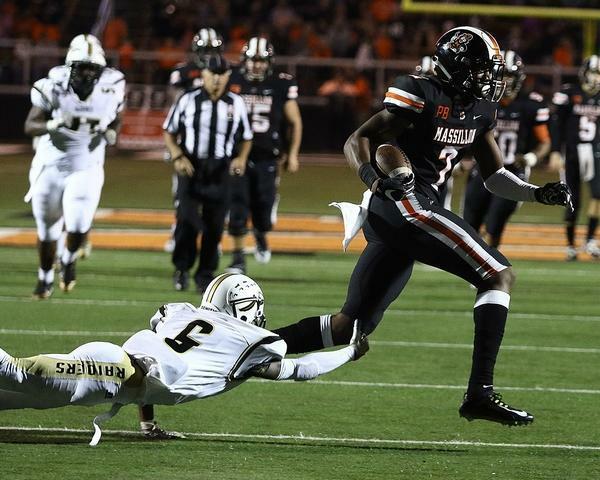 If there was an issue, though, for Massillon, it was its own miscues. The Tigers threw two interceptions – two of the three times their drives wouldn’t end in scores – as well as had a roughing-the-punter penalty. The first pick set up an Elijah Taylor 1-yard run to pull Warren to within 23-13. The roughing call kept a drive alive which resulted in Adams’ second score, pulling the Raiders to within 37-21.